Kenetrek's Hunting Gaiters are contoured to fit securely over any boot with a wide, full length hook and loop closure that opens with ease from the front. Adjustable tunneled top straps of sliding nylon with cam lock buckles provide a snug, snow-tight fit even when plunge stepping in deep snow. Waterproof and breathable Stormblocker membranes keep water out but allow perspiration vapor to escape. 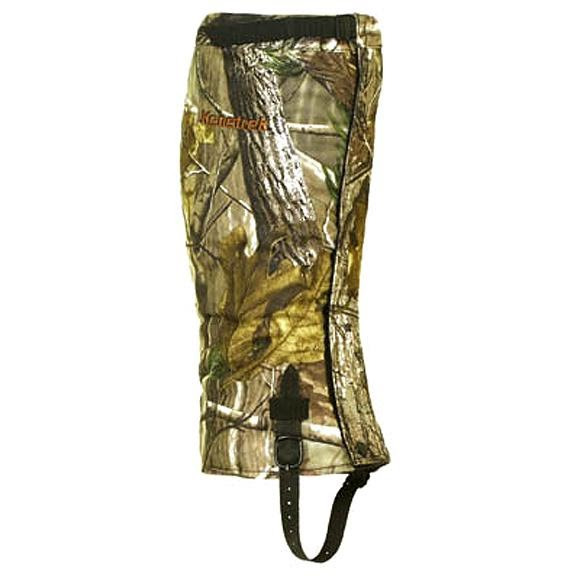 Kenetrek &apos;s Hunting Gaiters are contoured to fit securely over any boot with a wide, full length hook and loop closure that opens with ease from the front. Adjustable tunneled top straps of sliding nylon with cam lock buckles provide a snug, snow-tight fit even when plunge stepping in deep snow. Waterproof and breathable Stormblocker membranes keep water out but allow perspiration vapor to escape. Heavy duty Hypalon rubber straps on the bottom will not collect snow and ice like most other brands. If you do eventually wear them out, they are replaceable without sewing. Best of all, the tricot microfleece* exterior is dead quiet in the woods! * Solid colors have a coated nylon finish, does not have a tricot microfleece exterior like camo patterns. Impressed so far with build and fit...Will put them through the paces with my upcoming hunt on Prince of Wales and then Anchorage in December...If they're anything like my Kenetrek boots, winner! The XL fits my size 14 feet and calves very nice. Top straps pull in nicely to keep mud/snow from entering the top. Wide Velcro closure stays closed when moving through the brush. Material and straps are heavy duty. Mine were covered from top to bottom with caked on mud, they kept my pants clean and dry. Bonus they cleaned off nicely in the wash. I'm thrilled with these gaiters. Used the Kenetrek Hunting Gaiters for an Elk hunt with lots of snow and mud. Performed excellent kept pants clean and dry. And kept burrs from sticking to pants. Highly recommend these gaitors.